Random Event Sounds XP 5.0 free download. Random Event Sounds resides in the sys tray and will randomize the sounds associated with common system events like close program, minimize, maximize, start windows, etc. Random Event Sounds resides in the sys tray and will randomize the sounds associated with common system events like close program, minimize, maximize, start windows, etc. as well as other programs like AOL, Quicken, Windows Explorer, Windows Messenger, etc. It will also randomize Windows Screensaver and Desktop Wallpaper files. You can make a list of your favorite sounds for each event, and at given intervals the program will pick a new sound out of the list for each event. You can also cause the program to pick new sounds at any given time by right-clicking on the sys tray icon. Each event can individually be excluded from being randomized even if a list is provided. You can also decide for each event if you want Random Event Sounds to randomly select a file, or cycle through the list you have provided. Even if you do not want Random Event Sounds to pick files for you, you can disable the Auto-Randomize and manually tell it to randomize whenever you tell it to. Random Event Sounds was made to create an easy and efficient way of organizing and selecting system sounds, wallpaper, and screensaver. Not only does Random Event Sounds automatically select new sounds, wallpaper, or screensaver at given intervals; it provides an easy way to simply make new selections without the hassle of going into the control panel. Random Event Sounds resides in the system tray to provide quick access. New files can be added to the lists by browsing for them in the right panel on the main window. Random Event Sounds does not copy the files, but simply remembers the filename and where it is currently located. The file must be already stored to the hard drive. 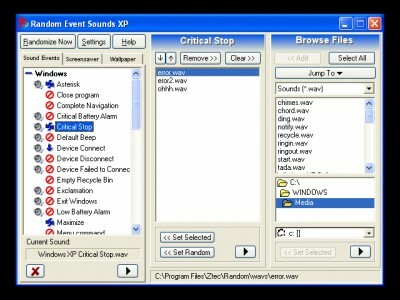 Random Event Sounds will manage sounds for all third party applications as well as system sounds. Random Event Sounds comes with 24 sample wav files. The about box is displayed each time the program is run. The about box is displayed each time the program is closed. Only 3 files may be added to each event�s list.